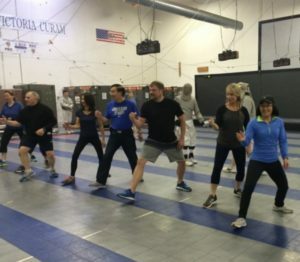 A fencing birthday party is extremely FUN, unique and something really capture the imagination and attention. 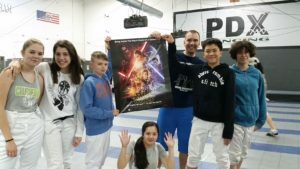 Fun games make learning the basics really fun, your party guests will learn the basics of defense and attack. Then onto the duel! Ready? En guarde! 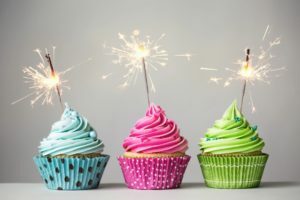 Group instruction, games and dueling of an hour and 20 min or so, then 30 minutes in our upstairs party room for cake and refreshments that you provide. Great for kids or adults. You can arrive early to decorate the room. We set up the table(s) and chairs, you provide you own paper plates, paper cups, napkins and dinnerware, we have a refrigerator for your ice cream. Ask your guests to wear t-shirts, long pants or basketball shorts that cover the knees, and closed toed athletic shoes (no sandals, no crocs, no flip-flops), girls can wear yoga pants. People can change clothing in the restroom if needed. For adults we do suggest changing T-shirts as this is a very active event. Deposit of 50% due at time of reservation. Private group parties, team building, scouts, homeschoolers and more . . . Team Building or Private Group sessions. 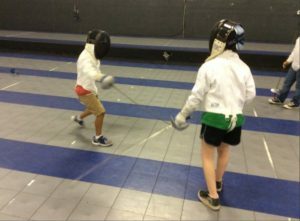 Fencing is perfect for team building or for private groups like scouts, home-schoolers, history buffs, etc. Fun and active, your team and group will learn the basics of defense and offense helping each other, then work together using different strategies. 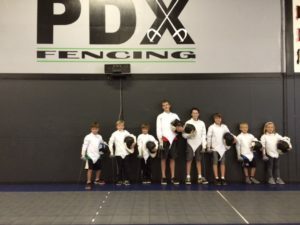 All fencing gear is included. Bring a change of clothes, we recommend a loose comfy t-shirt, basketball or loose shorts that cover your knees, athletic closed toed shoes (NO dress shoes, no sandals, no flip-flops, no crocs). Each session is two hours. Best weekday session times are either in the morning, 10 – 12 noon or 12 to 2:00. All sessions held during a weekday must end by 2:45 p.m. Available on most Sundays also. Click here for group flyer/reservation form. See below for more photos from different group events. Intel Team building: We do Intel groups year round. Saber is considered a hack and slash weapon. We love to show how to hack your co-worker! Work together learning the basics in a fun dynamic environment, teamwork makes it happen. Ask your team to wear t-shirts, long pants or basketball shorts that cover the knees, and closed toed athletic shoes (no sandals, no crocs, no flip-flops), girls can wear yoga pants. People can change clothing in the restroom if needed. For adults we do suggest changing T-shirts as this is a very active event, and you will want to change if you are going back to work. 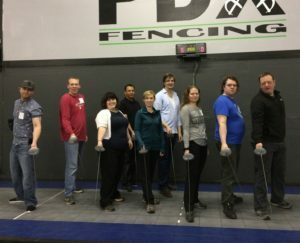 Fencing is a great company team building event!